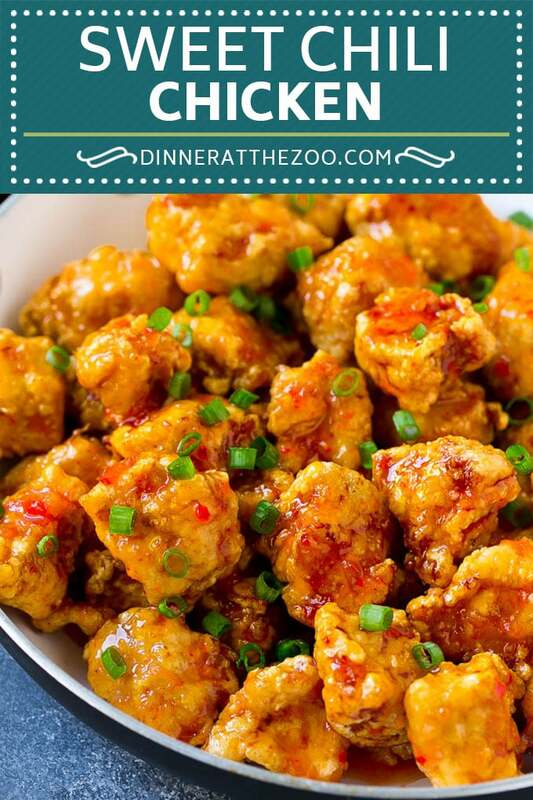 This sweet chili chicken is battered chicken pieces that are cooked to crispy brown perfection, then tossed in sweet chili sauce. Serve over rice for a complete meal that’s even better than take out! I love to make my take out favorites at home, like cream cheese wontons, egg rolls, lemon chicken and Mongolian beef. This sweet chili chicken is a remake of a dish I get at my local Thai restaurant and let me tell you, it’s a good one. I always have a bottle of sweet chili sauce in my fridge. 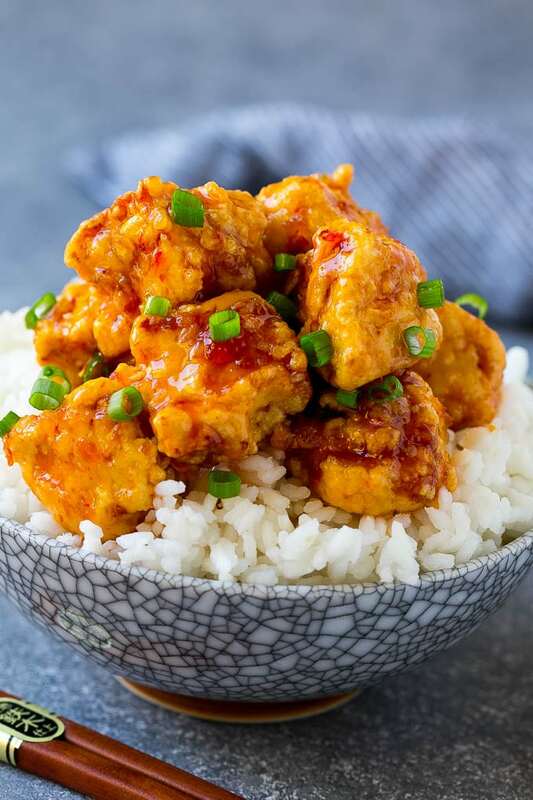 It goes well with so many different foods, but I have to say, this sweet chili chicken is one of my favorite ways to use chili sauce. This is an easy and flavorful dish that takes like it came from your local Thai restaurant. 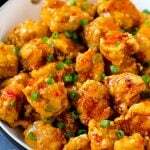 How do you make sweet chili chicken? 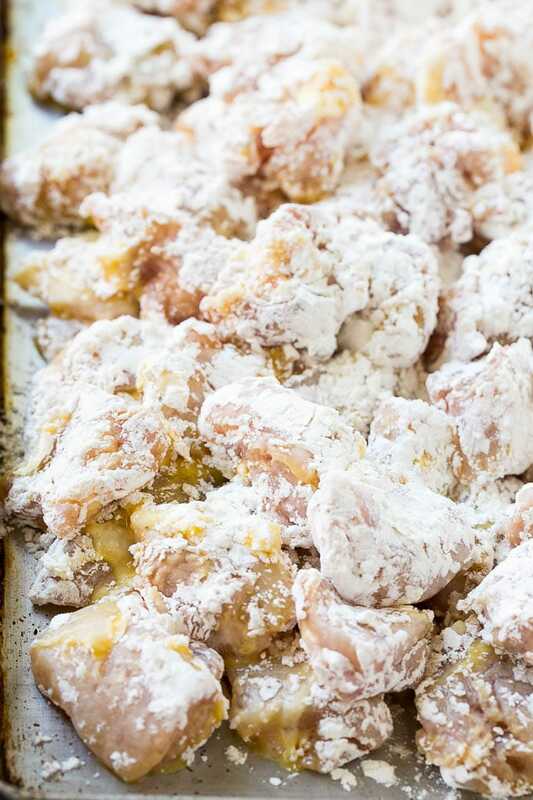 The first step is to batter your chicken pieces in egg and flour. I use boneless skinless chicken breasts. If you prefer chicken thighs, that would also be a great choice. 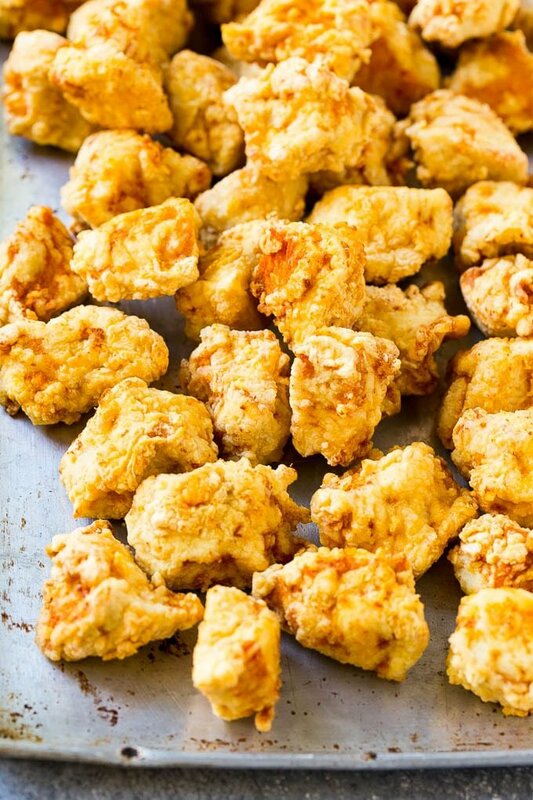 The chicken pieces get fried until they’re golden brown and crispy. The secret to easy frying is to use a thermometer to monitor the temperature of your oil. You want your oil to be right around 350 degrees F. If the oil is too hot, the outside of the chicken will burn while the inside is still raw. If the oil is too cold, the coating will absorb a lot more oil and you’ll end up with a heavier dish. Sweet chili sauce is a prepared Thai sauce that comes in glass bottles. It can be found in most grocery stores in the ethnic foods aisle. If your local grocery store doesn’t carry it, try an Asian supermarket. Despite its name, chili sauce is not overly spicy. I think of it as a Thai version of sweet and sour sauce. Sweet chili sauce pairs particularly well with chicken and shrimp. The chicken pieces get coated in the sweet chili sauce, then you’re ready to eat! Add a little sliced green onion, then serve your chicken over steamed rice. Not a fan of rice? Try noodles, quinoa or even zucchini noodles instead. This dish is best served immediately, as the coating on the chicken will start to soften when it hits the sauce. I often offer a green vegetable on the side, such as broccoli, green beans or asparagus. 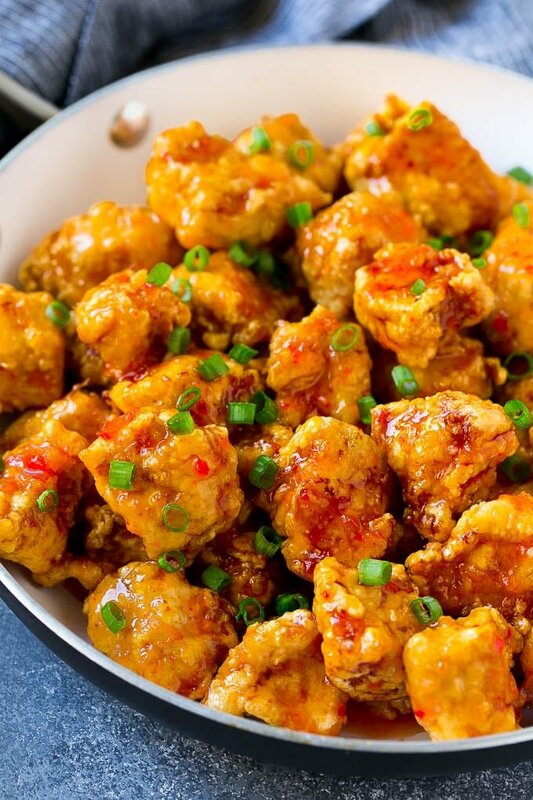 Sweet chili chicken is a unique and delicious dinner offering that’s sure to become part of your regular meal rotation. No need to call for take out when you can make it at home! 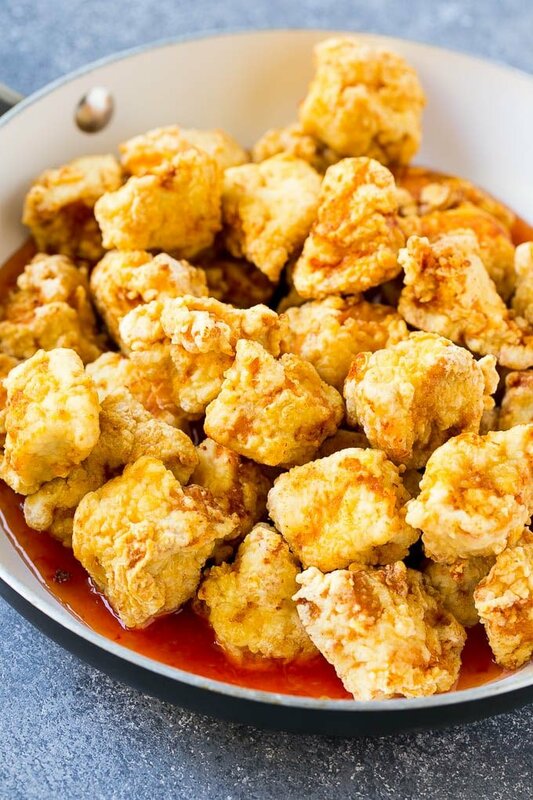 This sweet chili chicken is battered chicken pieces that are cooked to crispy brown perfection, then tossed in sweet chili sauce. Serve over rice for a complete meal that's even better than take out! Toss the chicken with the chili sauce. Sprinkle with green onions and serve. Oh yum!! My mouth is watering just by looking at your amazing photo. I love chicken, rice and a bit of spice. So this dish is perfect for me! This looks absolutely delicious! I wish I could dig right into this…I know my family would enjoy this too. That looks really good! I bet you could use the same chicken recipe for sweet and sour hong kong style chicken. Being able to make your fav take aways is such a good idea. I need to get practicing! This looks delicious, I think I will make this tonight for dinner. I do love Thai food and had sweet chili chicken before. It is so delicious! I’d love to make this recipe at home, for one of my next week’s dinners. Sweet chili is something I really love love love. And you right, the Thai sweet chili is what I prefer. It looks so nice on top of the white rice. I can imagine I am having them for my dinner already. May try this out for my Chinese new year celebration as we are having a big party on the first day. This looks so yummy. Big fan of chicken so I will definitly be trying this one out. Thanks for sharing it. For real though, this looks amazing! I can’t wait to give this a try this next week! Thinking Monday night’s dinner!! I am literally drooling haha! This looks INCREDIBLE! 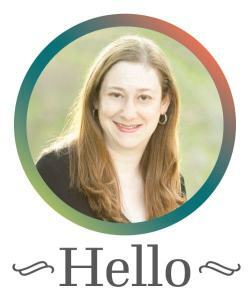 One of my favourite dishes – I am so excited to try your recipe. I need this in my life! I love sweet and heat mixed together. It’s one of my favorite flavor combinations. Just made it for dinner tonight, almost exactly as written (just sprinkle more sesame seeds before serving). Look and Taste are so attractive and yummy! Thanks for great recipe!